A celebration of farmers, chefs, brewers, artisans, and peppers! Granite Springs Farm and its peppers will be present at the festival. GSF peppers will be featured in several food products and mead (yes, mead)! We will take you on a tour of the pasteurization and inoculation process, explain the environment in which oyster mushrooms grow well, show off our beautiful fruits, and answer your questions! All are welcome to our public gathering to discuss the development of the Granite Springs Farm agrarian community. Newcomers and returning faces are equally invited! Crop Mob is kicking off the fall at Piedmont Biofarm in Pittsboro. 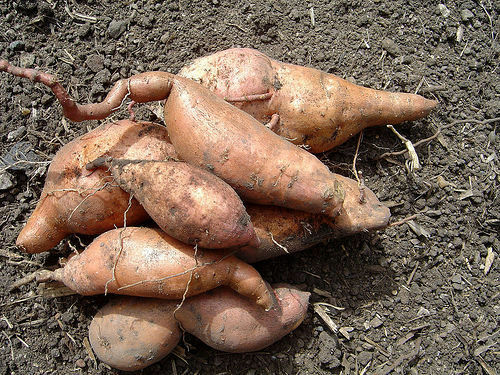 Mobbers will be working on the sweet potato harvest and digging and stripping peanut plants. Participants get to take home some sweet potatoes! RSVP smith.maggie@live.com so enough food is prepared for all. What’s in CSA #3 for Saturday and Sunday Oct 13-14?